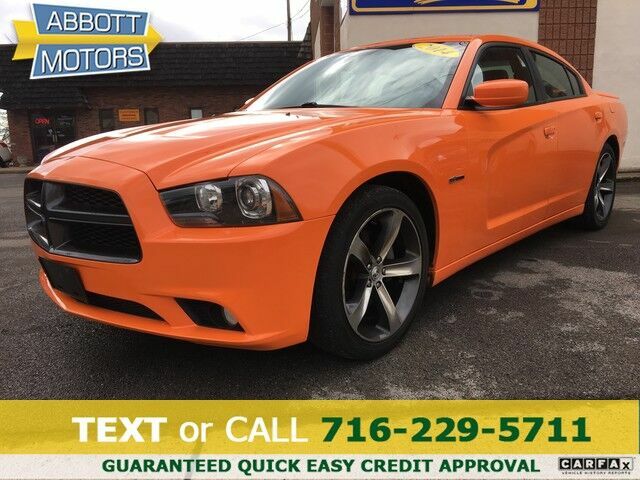 ABBOTT MOTORS, An exceptional car buying Experience, is offering this exceptional Header Orange Clearcoat 2014 Dodge Charger RT 100th Anniversary Edition for sale. CALL or TEXT (716) 229-5711 for quick answers to your questions about this vehicle. Your message will be answered by a real human never an automated system. We stock only the highest quality vehicles which have undergone a full safety inspection, fresh oil change, professional detail and Carfax Guarantee. All vehicles come with a Written Warranty and Extended Warranties are also available. This vehicle is loaded with great features, plus it comes with the CARFAX BuyBack Guarantee. Adjectives like impeccable, spotless, and immaculate can be used to describe how clean this Dodge Charger RT 100th Anniversary is, causing it to feel more like a new vehicle than a pre-owned one. The incredible 2014 Dodge Charger RT 100th Anniversary is an invigorating performance machine that will pump adrenaline into any driver who dares to take the wheel. Do you really need any other reason to want one? Engineered with the latest in technology and features, this vehicle is an automobile lover's dream. Marked by excellent quality and features with unmistakable refined leather interior that added value and class to the Dodge Charger. The best part about navigation systems like the one that comes in this car? You don't have to try to fold them up and stuff them back into the glove box. The quality high performance tires means that you will be able to drive off the lot without hesitation. You can drive off in the Dodge Charger RT 100th Anniversary feeling safe and confident. One look at the paint on this car and you'll swear even birds honor a no-fly zone around it. A perfect find to complement any rare automotive collection. This beautiful lass will turn heads everywhere she goes. The upgraded wheels on this vehicle offer improved handling and an attractive appearance. More information about the 2014 Dodge Charger: The Dodge Charger is a full-size sedan, offering strong V6 and V8 engines, along with rear-wheel drive--or all-wheel drive for some models. Chrysler also claims that the all-wheel drive system that's available in the Charger is the most advanced system offered in its class, as it completely disconnects the front wheels when not needed. Styling itself is also a big part of the Charger's appeal, as it pairs retro-muscle-car cues with modern touches. Also, the R/T and SRT8 models offer phenomenally good straight-line performance, with a drag-strip-worthy quarter-mile time in the high 12-second range, or zero to 60 in less than five seconds--yet with top speed at 175 mph and braking distance at just 120 feet from 60 mph, the SRT8 also chases supercars. Base Charger SE models are value-priced at about the same money as front-wheel-drive V6 mid-size sedans, while Dodge boasts that the Charger R/T is the most affordable V8 sedan in America and the Charger SXT is most affordable full-size car with 20-inch wheels. Gas mileage isn't bad either, provided owners go for the V6, which achieves up to 31 mpg on the highway with rear-wheel drive or 27 mpg with all-wheel drive. Strengths of this model include wide range of models, muscle-car performance, good gas mileage for V6 models, modern safety features, available all-wheel drive, and Retro-stylish design with modern details ABBOTT MOTORS has over 50 years of automotive experience! We are also a CARFAX Advantage Dealer. We offer quality certified vehicles and specialize in personal customer service. FINANCING FOR EVERYONE...ALL CREDIT APPS ACCEPTED. We look forward to helping you purchase your next vehicle. Apply Online 24/7 at Abbottmotors.com ... All Trade-ins Welcome... Same Day Delivery... Call or Text Today and See The Difference... We Look Forward to Serving You!! This vehicle may be subject to potential open recall(s). Vehicle recall information may be found at Safecar.gov. Please verify price, equipment, options and features with your sales rep before your purchase. We Look Forward to Serving You. *Tax, title, plates extra. All Financing On Approved Credit. We are a BBB accredited member.